Did you accidentally sprain your ankle while jogging? If you answered yes, then you’re not alone: ankle injuries are one of the most common injuries for runners, and the frustrating part is that it can be easily avoided if you were just a bit more careful where you stepped. Unfortunately, this isn’t always the case, for it’s bound to happen sometime down the line. However, it’s not the end of the world when it happens to you. In fact, by taking measures to treat and prevent it, you’ll be able to return to your normal running habits in no time. Here in this article, we’ll offer the best ankle support to make sure that you can get back on track. Let’s get to it! How do ankle injuries happen? How can I treat and/or prevent ankle injuries? How do I find the best ankle support? 2. Nordic Lifting Ankle Compression Sleeves. 3. McDavid 195 Ankle Brace. 5. Venom Neoprene Ankle Brace Lace Up Support. Sprain. Considered the most common ankle injury, it affects both athletes and non-athletes, men and women alike. It is the twisting or breaking of ligaments around the ankle, often caused by stepping off the curb the wrong way or missing that last step when walking down the stairs. Often, it’s characterized by a sudden, throbbing pain, which later leads to swelling. Strain. On the other hand, ankle strains are caused by the overuse of tendons in the ankle, particularly the peroneal tendons. They are pulled and stretched over their limit and, without proper rest, they become inflamed over time, which leads to an acute, even chronic pain in the area. Fracture. One of the most severe ankle injuries you can get, fractures are the breaking of bone that later shifts within the body, thereby leading to misalignment. Not only can it be painful, but it can also take the longest time to heal, from several weeks even to several months. For more information on different ankle injuries, check out this article here. RICE. Short for “rest, ice, compress, elevate,” RICE is a common method used to treat injuries; it reduces inflammation from injuries like ankle sprains, which can help to heal the affected part more quickly. RICE involves icing the injured part while keeping it raised for better circulation. Stretching and strength building. During and after your ankle injury, it can benefit you to perform some stretching and strengthening exercises for the ankle, as means of speeding up the recovery process and preventing it from happening again, respectively. The ankle often is weaker after the first injury, so it’s important to keep it strong and stable for subsequent runs. Some exercises include resistance training, whether with weights or elastic bands. Massaging and stretching out the affected area often can also be therapeutic, while in the meanwhile improve circulation and wellness in the ankle. Wearing ankle support. From boots to braces, there are a variety of different supports you can use for your injured ankle. They are often used for more severe injuries, and they are designed in a way so as to immobilize the affected part for better recovery: doing so can speed up the healing process. Giving it time. With any injury out there, it’ll take time for your ankle to get better. You might be frustrated that you can’t run or otherwise move around easily, but by giving it a few weeks to a month or two, it’ll save you a lot of trouble than if you were to start running before it completely healed, which could then lead to a more severe case of injury. Complete coverage. It’s an obvious that an ankle support shouldn’t just cover part of the area, but rather the entire part: this is to ensure that all aspects of the ankle—tendons, muscles, bones—are completely secured, so that you can guarantee a faster, more efficient recovery. Stability. Additionally, the ankle support shouldn’t be shifting around within your foot, for it’s meant to keep it grounded as it’s healing. It should be able to fit like a glove- snug, but also comfortable enough that it doesn’t cut off circulation in the leg and ankle parts. Adjustability. Even if you purchase the perfect size for your ankle, you’ll still most likely need to adjust it from time to time. 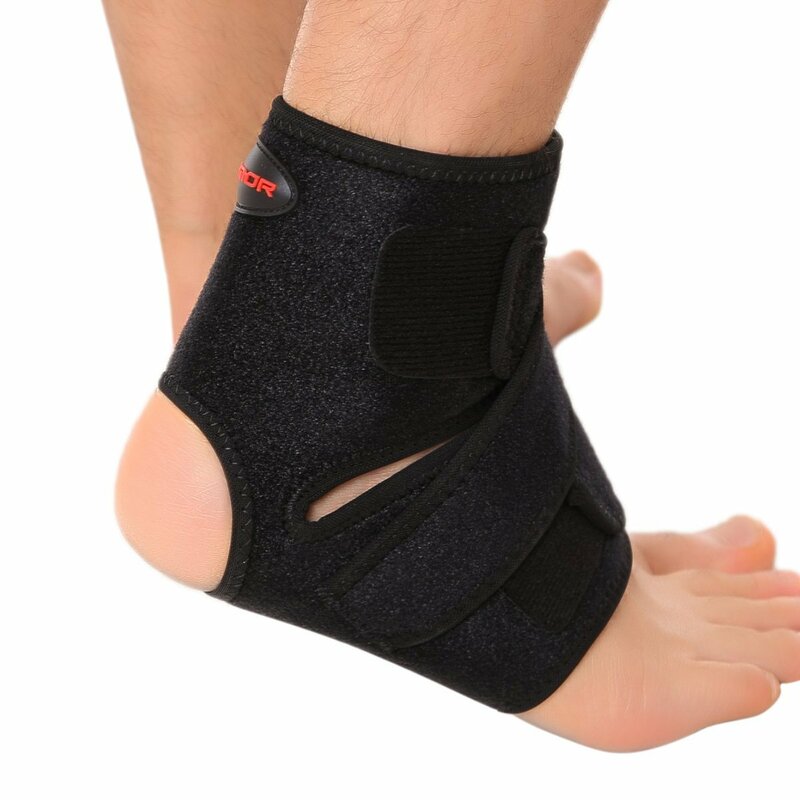 It helps that the ankle support has straps and laces that you can tighten or loosen whenever it suits you, and the fitting should be tight enough so that it doesn’t come apart as you move around. To learn more about choosing ankle supports, read this article here. With a figure-eight strap configuration and a bilateral design to fit either the left or the right foot, this ankle stabilizer from ASO offers security along with durability and strength to help you recover from some of the worst ankle injuries out there. It’s made from a lightweight, Coolflex fabric that’s breathable and offers wear durability. This ankle stabilizer contains a minimal structure with only 6 eyelets, making it easier to put on. Its strong stability feature makes it work well with ankle sprains. ASO’s ankle stabilizer might not be as useful for more severe injuries, such as fractures or strains. 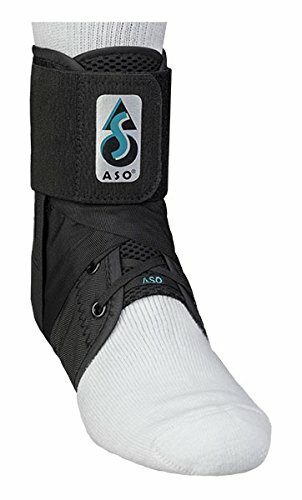 The ASO Ankle Stabilizer is a snug and light product that, when I first tried it on, was easy to slip into; I also appreciated that it was lightweight and not too clunky. However, it did have difficulties taking it off at the end of the day, since it got a bit too tight for me. 2.﻿﻿﻿﻿ Nordic Lifting Ankle ﻿﻿Compression ﻿﻿Sleeves. Made from Spandex and latex yarn, this ankle compression sleeve from Nordic Lifting offers comfort along with compression, so that you won’t have to mind wearing it while you’re injured. Besides treating ankle problems, it can also be used to treat plantar fasciitis and arthritis. It contains a warming effect, which conserves heat to keep circulation going in the ankle. This compression sleeve can be used to treat all types of sports injuries (e.g. running, basketball, etc.). It comes in a pair, so you can use one or the other (even both) for any occasion. 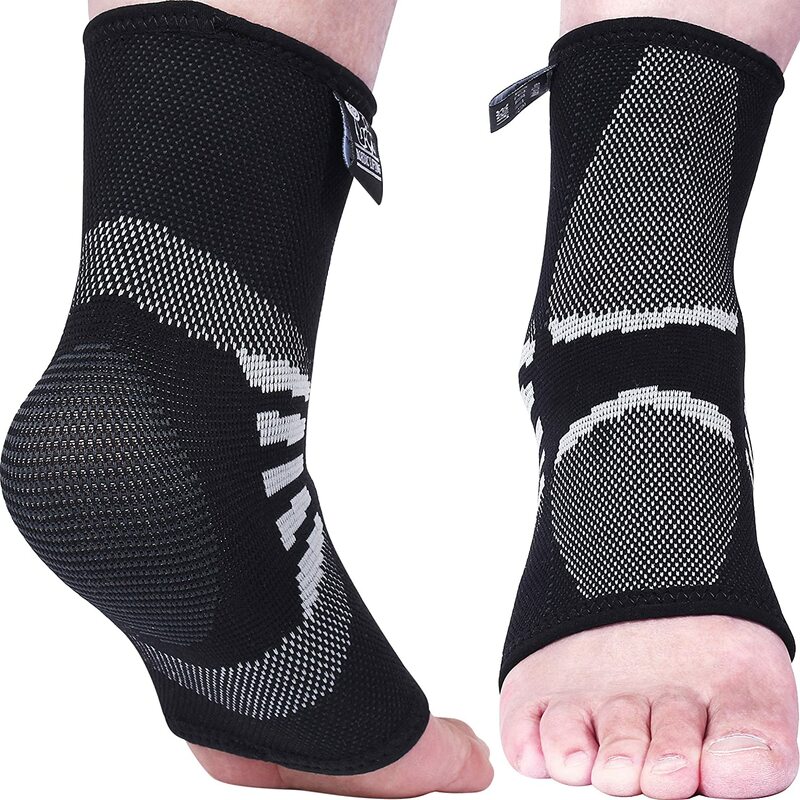 This ankle compression sleeve can at times feel a bit stuffy and thick, especially after wearing for a long time. Compression in the ankle could be a bit tighter. After trying on Nordic Lifting’s ankle compression sleeve, I found it to be quite nice and warm, which helped loosened the tension in my ankle as it recovered. However, it started to feel quite hot and stuffy afterwards, which caused a bit of discomfort. 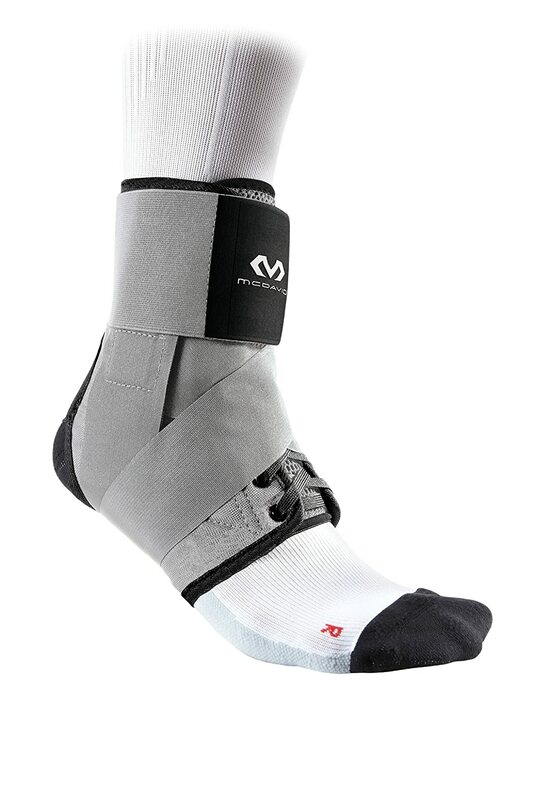 A popular product in the ankle brace sector, McDavid’s 195 ankle brace consists of a figure-six strapping system that mimics athletic tape, used for improved circulation and protection. It also has a ventilated tongue for better breathability. McDavid’s ankle brace contains both straps and laces for that extra security when wearing it. Since its structure is similar to that of athletic tape, it saves you the time and effort of having to tape your ankle every time. It offers a wide range of mobility while also keeping the injured part set and stabilized for good recovery. The strapping and lacing system can be quite complex, thereby a hassle to take off after a long day. I decided to try this popular ankle support brand, and I must say that it does a decent job of being extra secured, but also offering me a range of motion to move around in. My only wish was that the straps and laces could be a bit more straightforward to put on and loosen afterwards. This product from Liomor has both anti-odor and anti-itch properties, for it’s made from moisture-wicking material and thereby keeps your ankle dry and comfortable. It also has a snug, criss-crossed design for stability and security. Liomor’s ankle support is made from lightweight and elastic materials, so as to provide comfort while wearing it. It is anti-itch, so that you don’t need to wear socks under it, for it’ll not rub the wrong way. Besides treating ankle sprains, it can also be used for treating tendonitis. This ankle support could use a better secured system, for the Velcro straps seem to come off often. I felt instant relief when I put on this ankle support from Liomor; I didn’t even need to wear socks! I never had a problem with skin irritation, but I wish that there were more straps to fasten onto for better security. 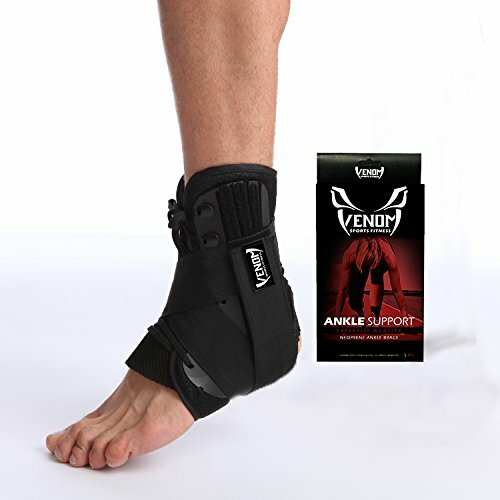 Good for mild-to-moderate ankle sprains, this support system from Venom has plenty of straps and laces along the lateral and medial sides to keep your ankle in place for long periods of time. It comes in different sizes for different ankles as well. It contains solid side supports, so that your ankle is securely fastened within the brace. Venom’s ankle brace also has double straps for extra security, in case you need it. It’s made from sturdy and durable material, which can last longer for future use. This ankle brace can be a bit bulky to wear underneath shoes. The bottom of the brace might feel comfortable after a while of wearing them. I was pleasantly surprised that, upon putting on Venom’s ankle brace, my ankle was feeling good and secured inside of the product. However, the only issue is wearing shoes with it; I have to really squeeze into them in order to make it fit. While these ankle support products have their merits, the winner would have to go to the ASO Ankle Stabilizer (#1). Not only is it made from light, cool material, but it also has a minimalist strapping system that makes it easier to take off at the end of the day, without having to sacrifice for security (in fact, it’s very snug and doesn’t slip off). That said, it’s sure to help your ankle recover sooner than later. Like this article? Comment and share with others!